At this month’s company town hall meeting, not one, but two employees were awarded with the Above & Beyond Award from Rapid Packaging and Berg Bag Companies. Above & Beyond Awards are just that – recognition for actions that go above and beyond the call of a duty. 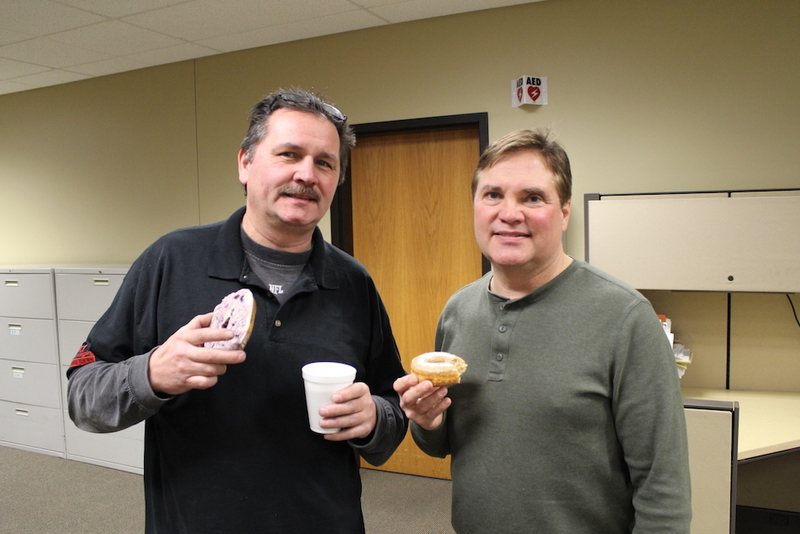 This month’s recipients are Bob Beaver and Mark Koerner for their outstanding commitment to customer service. Rapid Packaging closes business in recognition of Thanksgiving. During this long holiday break, Bob came into the office not once, not twice, but on three different occasions to help out a customer and fill a product order they desperately needed while their primary supplier was unreachable. Bob acted without hesitation and came in on his days off to help a customer in need. In turn, that customer was able to continue with their production schedule over the long holiday and keep their commitments with their customers. On New Year’s Eve, Mark was on an out-of-state equipment installation. Conveyor legs we expected to be delivered to the customer that day to complete the install as scheduled. After hours of delay, Mark tracked down the freight carrier to find out the semi-truck with his parts had broken down on the highway about 1.5 hours out of town. Mark drove out to the broke down semi, hopped in the trailer alongside the highway, retrieved his conveyor legs, and made the 3 hour round-trip journey back to the customer to complete the install as targeted. The customer was happy and closed their doors in time for New Years and Mark made it back home in time for his traditional New Year’s fondue with his family. Dedication to service, commitment and excellence is characteristically part of the culture at Rapid Packaging. We applaud your efforts and honest commitment to customer service. These awards are well deserved and we thank you.